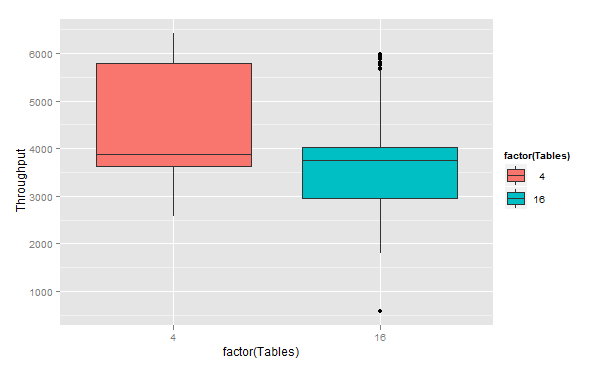 I enjoy working with R, and though I am not even close to be proficient in it, I want to share some graphs you can build with R + ggplot2. 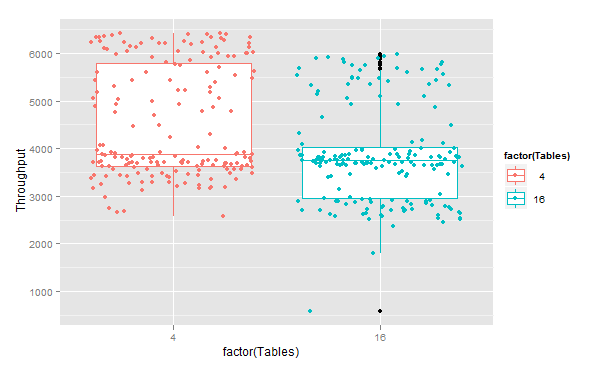 The conditions of the benchmark are the same as in the previous post, with difference there are results for 4 and 16 tables cases running MySQL 5.5.20. Let me remind how I do measurements. 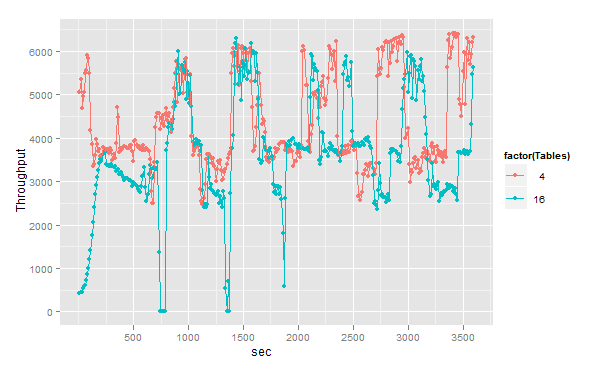 I run benchmark for 1 hours, with measurements every 10 seconds. So we have 360 points – metrics. The previous graph is not very representative, so we may add some lines to see a trend. 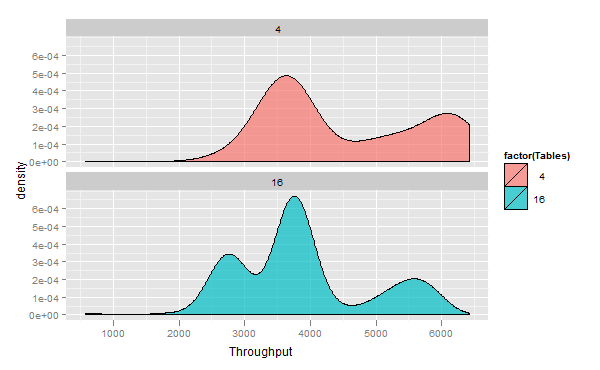 This looks better, but still you may have hard time answering: which case shows the better throughput? what number we should take as the final result? With jitter we see some dense areas, which shows “most likely” throughput. 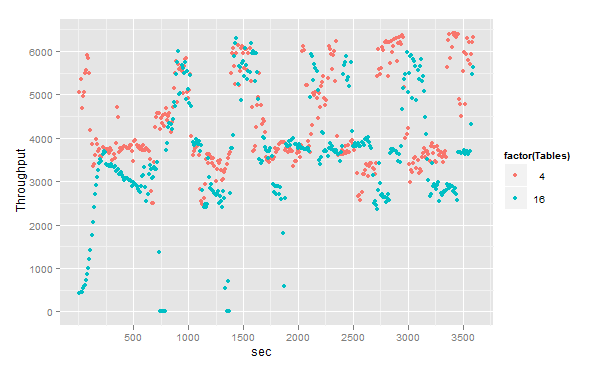 In these graphs Axe X is Throughput and Axe Y represents density of hitting given Throughput. That may give you an idea how to compare both results, and that the biggest density is around 3600-3800 tps. – the line at the bottom of a box – 25% quantile (you should have an idea already what does that mean). You may decide what measurements you want to take to compare the results – median, 75%, etc. And, yes, if you wonder what to do with such unstable results in MySQL – stay tuned. There is a solution. 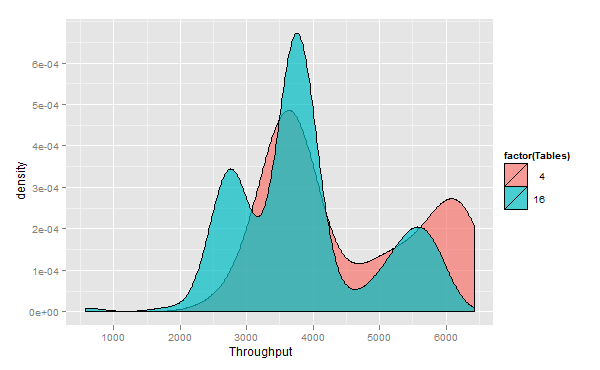 Hey Vadim, nice post, but reading through it I kept wondering why you didn’t plot a simple histogram with the hist( ) command, with a superimposed mean or median line. That would have shown you just about all you wanted. That’s true. 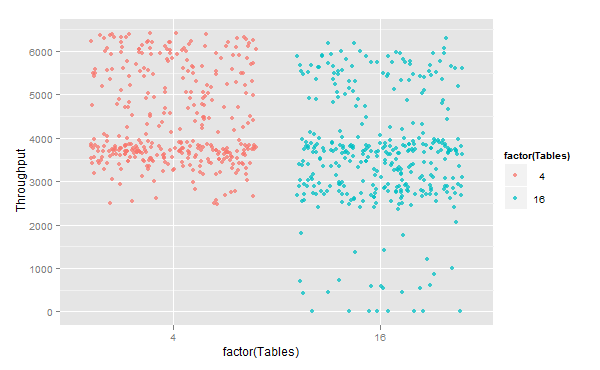 As I said I am not that proficient in R, there probably are better ways to do what I did. I just liked these graphs and wanted to share them. Do you have any examples of how to actually extract the values out of that? The graphs are pretty and all, but it’s important to have the actual concrete numbers. That is also not so hard, though some time is needed to figure it out. Been poking around “R” , your blog gave it a boost! Thanks for sharing it.